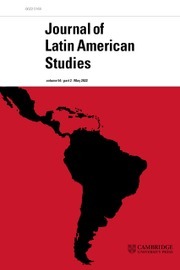 Journal of Latin American Studies presents recent research in the field of Latin American studies in development studies, economics, geography, history, politics and international relations, public policy, sociology and social anthropology. Regular features include articles on contemporary themes, short thematic commentaries on key issues, and an extensive section of book reviews. This virtual special issue highlights some of the exciting directions that scholarship on the Cold War in Latin America has taken over the last decade. Los editores de JLAS se reunieron durante la conferencia de LASA en Barcelona que se llevó a cabo en mayo de 2018. Conversaron sobre el proceso de evaluación de artículos, el tipo de artículos que solemos publicar, y algunos de los errores que los autores deberían evitar al preparar sus artículos. Grabamos esta conversación y la puedes escuchar en castellano aquí. At the 2018 LASA congress in Barcelona, the editors of JLAS got together to talk about the journal’s review process, what kinds of articles we are looking for, and what are some of the common pitfalls for authors to avoid. We recorded this discussion, and you can find it here in English.